Akos Buzsaky was shown the door after being unwilling to sit on Pompey’s bench. Izale McLeod was once relegated to the role of Blues substitute having been unhappy with a request to serve in an unfamiliar wide position. As for Tal Ben Haim, he flew back to Israel for two months to receive treatment on an injury the Fratton Park medical staff could not locate. He returned rejuvenated – two weeks before the scheduled FA Cup final against Chelsea in 2010. Then there is Danny Hollands. And how Pompey need to keep professionals like him if they are to finally earn promotion next season. The midfielder suffered ligament damage in Pompey’s semi-final first-leg against Plymouth last month. Many felt Gary Sawyer’s ugly challenge warranted a red card rather than the yellow ultimately brandished. Some 72 hours later and Hollands was again in action, shrugging off the agony in his left ankle to retain his place. 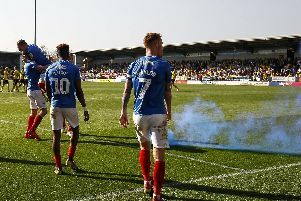 The result for Pompey was the end of promotion hopes – the outcome for Hollands is he is unlikely to play before August. The 30-year-old volunteered to play through the pain, the drive for Wembley overpowering any personal discomfort. There was no intention to quit in the interests of self-preservation, as other footballers have done through the Fratton Park decades. Instead, Hollands was required to keep intact the midfield partnership with Michael Doyle which had been the heartbeat of a sixth-place finish in League Two. After 44 minutes he left that Home Park pitch having exacerbated his ankle problem. The ligament had come away from the joint, a sliver of bone was left floating inside. He subsequently underwent the surgeon’s knife and yesterday had the cast removed as he inches towards a return to football. Out-of-contract yet wanted by Paul Cook, talks are ongoing with chief executive Mark Catlin and finance director Tony Brown. Hollands, who lives in Fontwell, is eager to remain, prepared to take a pay cut to achieve it. The ex-Charlton man has been at Fratton Park since March 2014 and is a prized pro, low maintenance, good around the club and fully committed. Crucially, Cook can trust him. Pompey’s squad clearly requires summer repair work if it is leave League Two. And it needs players possessing the backbone of Hollands to achieve it.